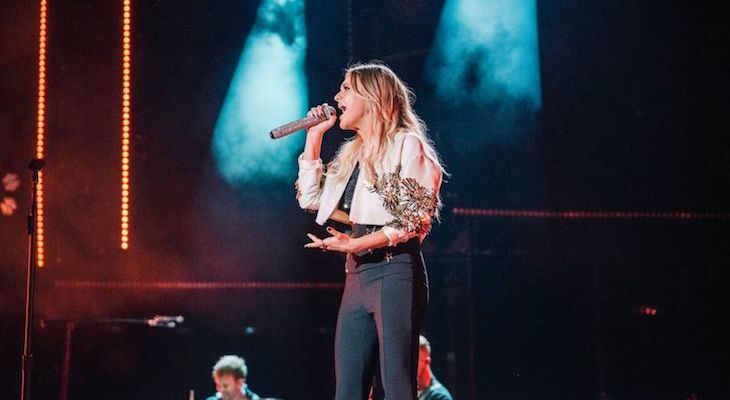 Fresh off the release of her sophomore album Unapologetically, Ballerini kicked off her tour in February with country singer Walker Hayes as the opening act. Ballerini is one of country music's rising stars who was signed to her first record label at just 19 years old. She was named one of CMT's Next Women of Country in 2014 where her song "Love Me Like You Mean It" reached number one on the Billboard Country Airplay chart. This made Ballerini the first solo female country music artist to achieve a number one hit with her debut single since Carrie Underwood did so with "Jesus, Take the Wheel" in 2006. Ballerini also became only the fifth solo female country music artist to earn back-to-back number one hits with her first two singles when her song "Dibs" reached the top of the Country Airplay chart. In early 2017, Ballerini was named to Forbes' 30 Under 30 – Music list at number two. That same year she received two Academy of Country Music Award nominations for Female Vocalist of the Year and Video of the Year for "Peter Pan." Unapologetically is a collection of songs that Ballerini carefully chose with the purpose of making an "intentional album." Tickets are available at axs.com to see Ballerini perform at the Arlington Theatre next month.